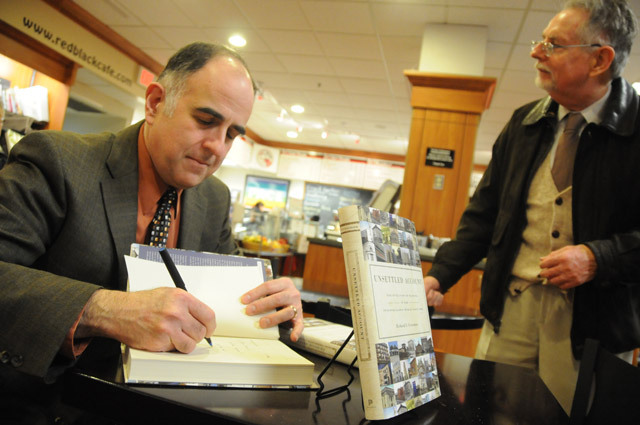 At left, Richard Grossman, professor of economics, celebrated his latest book, "Unsettled Account: The Evolution of Banking in the Industrialized World Since 1800" (Princeton University Press) during a book-signing event Dec. 13 at Broad Street Books. Richard Grossman, professor of economics, is the co-author of “International Aspects of the Great Depression and the Crisis of 2007: Similarities, Differences, and Lessons,” published in the Oxford Review of Economic Policy 26(3), November 2010, pp. 318-338. Richard Grossman, professor of economics, is the author of the book, Unsettled Account: The Evolution of Banking in the Industrialized World since 1800, published by Princeton University Press in June 2010. The 400-page book provides a comparative history of banking focusing on four types of events that have been central to the lifecycle of banking systems: crises, bailouts, mergers and regulatory reform. Richard Grossman, professor of economics, was interviewed on “The Gold Standard and the Eurozone Crisis” by Voxeu.eu. Richard Grossman, professor of economics, presented a paper, co-authored with Chris Meissner (University of California at Davis), titled, “International Aspects of the Great Depression,” at a conference on Lessons from the 1930s Great Depression for the Making of Economic Policy, hosted by the British Academy in London on April 16-17. Grossman also served as a discussant for a paper on “The Political Lessons of Depression-Era Banking Reform.” Conference papers are available online. Richard Grossman, professor of economics, was interviewed on five radio stations in November on the fiscal crisis facing states. The stations include WOOD Grand Rapids, Mich.; WHAS Louisville, Ky.; WHJJ Providence, R.I.; WCHV Charlottesville, Va. and WSYR Syracuse, N.Y.
Richard Grossman, chair of the Economics Department and professor of economics, appeared on Fox Business Radio on May 22, 2009. In the news segment, Grossman speaks on the historical recession and offers his views on how the country got to this point, how we will emerge from the problem and where are the opportunities. Richard Grossman, chair and professor of economics, was quoted in “Narrow Spreads Strangling Triple-A Appeal,” by Steven D. Jones, Dow Jones Newswire “In the Money” column, March 19, 2009. Grossman also gave radio interviews on the Treasury rescue plan on March 23 to WFLA (Tampa, FL), KFAQ (Tulsa, OK), KVI (Seattle, WA), KTRH (Houston, TX), and KOGO San Diego, CA. Richard Grossman, chair and professor of economics, was interviewed on WJLA TV in Washington, DC on the financial crisis. Masami Imai, assistant professor of economics, assistant professor of East Asian studies, and Richard Grossman, chair and professor of economics, are co-authors of the article, “Japan’s Return to Gold: Turning Points in the Value of the Yen during the 1920s,” published in Explorations in Economic History, 2009. 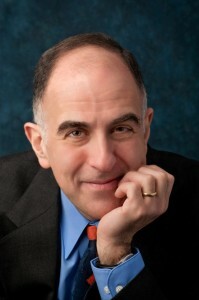 Richard Grossman, chair and professor of economics, was quoted in an article titled “The Turning Point” about the Lehman failure at Thedeal.com (carried by Reuters). In addition, Grossman gave interviews on banking system “stress tests” and the prospects for government ownership on WOOD (Grand Rapids, Mich.), WJNO (West Palm Beach, Fla.), WHAS (Louisville, Ky.), WFLA (Tampa, Fla.), XM Satellite Radio, KOGO (San Diego, Calif.), WILM (Wilmington, De. ), WSYR (Syracuse, N.Y.), KVI (Seattle, Wash.), and WGST (Atlanta, Ga.).